The Task Force is led and facilitated by two co-chairs that have been appointed by President Stoltzfus for a two-year commitment: Beth Martin Birky, professor of English, women and gender studies director and Title IX deputy coordinator, as well as Dominique Burgunder-Johnson, director of marketing. This new group has intentionally been named a Task Force, as it is designed to be a time-bound working group. Unlike committees, which are often not time-bound and are sometimes more discussion-based, the Task Force has a two-year time frame for existence with the expectation of meeting very specific and actionable goals within that time. As the Task Force is in its beginning stages of conception, Birky and Burgunder-Johnson are looking for GC students and employees to make up the working group. Interested individuals must nominate themselves to fill 12 spots that will include six employees (three teaching faculty and three administrative faculty/staff) and six students. Birky and Burgunder-Johnson are looking for a variety of skills in the task force. Some skills they’re looking for include responsibility, availability and a strong commitment to full participation, connecting to the community and being a good listener. 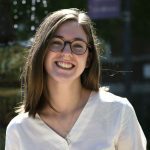 “I hope members of the Task Force are willing to move from valuing of diversity toward a clearer understanding of the power dynamics that shape our community and inform how individuals experience equity and inclusion at Goshen College,” said Birky. The Task Force is hoping to have members selected by April 19. According to Birky, 11 self-nominations have been made. Interested persons have until Saturday, March 31 to self-nominate. For further information and to submit the self-nomination, students and employees can visit goshen.edu/taskforce. On top of helping create a more inclusive community, members of the Task Force will also be compensated for their efforts. Student members of the committee can arrange to receive an hourly wage or academic credit for their work on the Task Force. Hourly GC employees (not including students) may receive regular hourly wages for time spent on Task Force activities in coordination with their supervisor. “I hope that the Task Force can harness some of the amazing energy GC already puts into diversity, equity and inclusion work and have it serve the needs of more students [and] employees, as well as our alumni and other friends of GC,” Birky said.